Fall is probably the best time of the year to head to the Northwoods of Wisconsin. Well, I do enjoy spring and summer as well. And then there’s the winter’s ice fishing. I guess any time you head north is going to be a good time. With the changing colors of the trees, a ride down a country road through the woods on a sunny day can only be beat by a view of the shoreline from your boat while muskie fishing. Muskie fishing will be getting better and better with every passing day leading into fall. My next trip up north is scheduled for October. This will be my annual Father/Daughter trip with Lisa. She’s anxious to boat another muskie or two and some walleyes and big crappie. October is a good time to get them all. I just received the September 2014 Newsletter from the Forest Lake Country Store. Thanks for sharing Mark. From some emails that I’ve received, I know many of my readers are looking forward to hearing the latest from the Land O Lakes area. Fall is setting into the north country. Cool evenings and nights have become the norm rather than the exception. Patches of ferns are giving up their summer green colors for a coat of yellow and some of the maples are showing crimson red. A badge of honor for the first trees to give up their vibrant green summer leaves! It will be a while before the trees are in full fall color, but traveling down Highway B you can start to see that fall is on the way. This is not really a product, more of a community service. We are selling $5 raffle tickets to support the Disabled Veterans Transport Van Fund. North Woods Harley Davidson (in Arbor Vitae) and the Minocqua Brewing Company are auctioning a 2014 Harley Davidson motorcycle as a benefit for Disable Veterans Transport Van. The bike is parked in the lower level of Minocqua Brewing if you care to take a look at the prize. Currently the vehicle that transports veterans from Oneida, Vilas and parts of Forest counties to the V.A. Center in Iron Mountain only holds 3 passengers and is not wheel chair accessible. This fundraiser is helping the DAV purchase a 10 passenger van that is wheel chair accessible. The winning ticket will be drawn during halftime of the Packer-Viking game at a private party at Minocqua Brewing on October 2nd. Your raffle ticket stub will be your only way into the party. However, you do not need to be present to win. Stop at the Forest Lake Country Store and buy a ticket or three to support this noble cause! The Land O’ Lakes Community Garden has shared some news. September 13 from 9am to 3pm is the 22nd Annual Colorama Arts & Crafts Fair held at the Boulder Junction Community Center. Join us for our annual indoor and outdoor arts and crafts show and farmers market including lots of fall decor. Coffee and pastries will available in the morning and our ever-popular venison BBQ sandwiches will be served for lunch. Plan to visit the arts and crafts show along with our area shops and galleries. September 20th the following weekend, the Boulder Junction Community Foundation hosts the 55th Annual Colorama Dinner. Appetizers will be served at 5:15pm and at 6pm a delicious chicken dinner with all the trimmings and traditional wild game stew with dessert and beverages will be served. Held at Camp Manito-wish YMCA’s historic Nash Lodge on Hwy K west of Boulder Junction, come enjoy a wonderful meal, served family style by the North Lakeland School 8th Grade Class. Lots of door prizes will be given away and the 2014 raffle drawing for the restored 1947 Old Town Canoe, Hand-Carved Pileated Woodpecker and $500 Peeplelures Gift Certificate! New this year will be the People's Choice Awards presented for the most popular menu item at each area restaurant. Voting has been taking place all summer and there is still time for you to do so. Advance ticket sales are strongly recommended and can be purchased at the Boulder Junction Chamber of Commerce or at the Boulder Junction Community Foundation booth at the Tuesday Flea Markets during the month of August. $16.00 adults and $8.00 children, 12 & under. Adults meals available for carryout from 6:30pm to 7:30pm. Contact the Boulder Junction Chamber of Commerce for information on both Colorama events at 715-385-2400 for more information. From Kelly Kolinsky, sister of Cliff Kolinsky. This year we are having a 5 Mile Fun Run • Walk • Bike on Saturday, September 20th, and a 4-person, 9 hole golf scramble on Sunday, September 21st. The 5 Mile Fun Run • Walk • Bike event will begin at 2 pm (cst) rain or shine at Black Oak Inn and end at Brew’s Pub in Land O’ Lakes, WI. The course will move along a portion of the beautiful Wilderness Lakes Trail, so participants should anticipate a combination of gravel and paved roads. The race fees are $20 for early bird registrations post-marked by Friday, August 29, 2014, and $25 for registrations post-marked after that. T-shirts are in adult sizes and guaranteed only for early bird registrants. Registration forms are available at several local businesses and may be sent with a check payable to – Kelly Kolinsky, 1020 Feltl Court Apt 306, Hopkins, MN 55343. Pre-race activities are planned for Friday, September 19th, at Black Oak Inn and include packet pickup and registrations from 6 to 9 pm. Participants may also pick up packets and register the day of the race from noon to 2 pm at Black Oak Inn. Post-race activities will be held at Brew’s Pub and includes food, drinks, and live music! The Golf Scramble event will begin at 9 AM, rain or shine, at the Gateway Golf Course in Land O’ Lakes, WI. The event is a 4-person, 9-hole scramble. The fees are $50 per person and include the 9-hole green fees and cart rental. Please contact Kevin Konnow at 715-547-3335 to register or for more information! Proceeds from both events will be donated directly to the ABR nonprofit organization, which provides free running prosthetics to amputees. This act of generosity is especially important because running prosthetics are not considered medically necessary, so they are not covered by insurance. Cranberry Fest is a family fun festival having something for everyone with activities being held throughout town. Fresh Locally Grown Cranberries, Cranberry Marsh & Winery tours, Large Arts & Crafts show, World's Largest Cranberry Cheesecake, Cranberry Food of every kind, Antique Market, Cranberry Fiber Arts and Weavers Show & Sale, Bike, Walk, & Run Fitness Events, Family Entertainment, Farmers Market, Cranberry Fest Market Place - flea market/buy sell items, and much, much more! This is the last BIG Hurrah in the north woods for the fall season. Cabins and motels fill up with people looking for another good reason to be in the north country. Put this on your schedule! Sept. 18th Movie afternoon will be 1:00 p.m.
We will be showing Philomena, starring Judi Dench and Steve Coogan. A world-weary political journalist picks up the story of a woman’s search for her son, who was taken away from her decades ago after she became pregnant and was forced to live in a convent. September 24th Our School-Year story time will start on Wednesday September 24th at 10:30 a.m. There will be a Story opportunity every Wednesday thru winter. The All preschool children are invited to join in the stories, games and activities. This program is for full-time area residents who have a child below 5-Year kindergarten age. 1000 Books Before Kindergarten programs are designed to help encourage reading to babies, toddlers and preschoolers to prepare them for school. All you need to do is come to the Land O' Lakes Library to sign up. For more information on any Land O’ Lakes Public Library events, check out our website at landolakeslibrary.org. If you like antiques and want to live with them in the 21st century, give them a vintage "shabby chic" look. This workshop will focus on using Annie Sloan Chalk Paint to create this designer look. No sanding and no priming necessary means anyone can do this simple technique. After painting, the item is given a clear wax finish that will give any picture frame or old piece of furniture a new life. Small picture frame, minus the glass and backing. 1 - 2 inch flat paint brush, not a sponge brush. Smock or appropriate clothing for painting. Master basket weaver, Hollie Pierce is back again to teach this beginners class. You will complete the market basket with oak "D" handle by the end of class. Join artist & entrepreneur Eva Smith-Furgason of Ironwood, MI as she discusses her experience with selling on-line through Etsy. Maybe you are interested in selling your work this way? Learn what is needed to have your own on-line shop. Back by popular demand, this group is open to water media painters. Bring your supplies, a work in progress or start something new. Get help with the tricky and sticky bits, learn a new trick or two, meet new friends and paint, paint, paint! A safe and encouraging environment to share your work and learn from each other. No registration needed. For further information or to REGISTER for all classes, please call Wendy at 715-547-3950. Thank again for taking the time to read our newsletter. Most of this material is provided by the people creating or hosting events or offering news relevant to residents and vacationers to the Land O’ Lakes area. We thank all those that take time to send us the information for publication. If you attend these events tell them you heard about it here and let them know you appreciate them making the effort to share the news! On Labor Day we will open at 7 AM and close at 2 PM and Tuesday after Labor Day we will be closed starting our Winter Schedule. We are thankful for all the well wishes we have received from our customers on the shorter winter schedule. 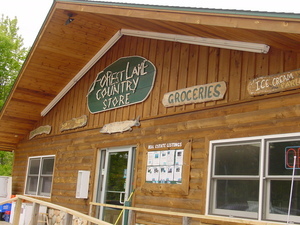 Forest Lake Country Store is not a sponsor of Illinois Outdoors.